This week's info dump on Pokémon Sun and Moon was possibly the most substantial yet, packed with information on new Pokémon, gameplay aspects and areas to explore - this gallery has lots of the information in one place. One new feature is 'Z-Moves', which are supercharged attacks that you can initiate once per battle, assuming your trainer has a Z-Ring and relevant Z-Crystals. You can see it in action below. 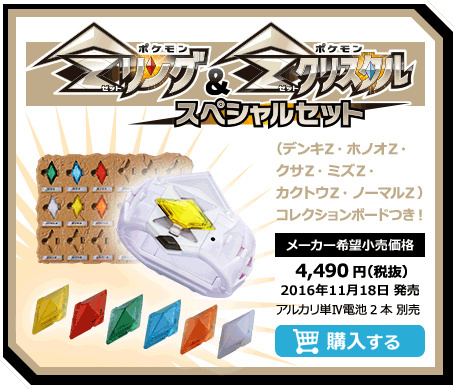 Also intriguing is that The Pokémon Company is taking a bit of a lead, we'd suggest, from the chunky Yo-kai Watch toy in producing real-life versions of the Z-Ring and crystals that light up, vibrate and make noise. What's intriguing about the Sun and Moon toys, though, is that they'll react in time with the game; when your Trainer uses the virtual version of the Z-Ring your own will light up and behave the same way. The initial offerings will arrive alongside the games in Japan, and that also appears to be the plan for the West. These toys could certainly prove a hit, especially if the functionality lives up to the potential of the concept. Do you think they'll be a success? I will be preordering this! Man id love if they had a mega evolution bracelet as well! Gotta buy 'em all!!! Erm, GONNA buy 'em all!!! Sorry but Nintendo needs to step it up. Pokemon and a plastic watch doesn't get me excited!!! Comon Nintendo, kids who like Pokemon usually don't have any money, so why push this garbage so much. Sigh... I want this for some reason. I'm excited for the games, nothing more. The way of playing Pokemon 3DS will be much like Yokai Watch. Yokai Watch vs. Pokemon much ? The gems look like something I would like. I've always had a strange fascination with collecting strange and pretty gems/crystals. I hope this doesn't have an impact on the competitive aspect of the game, since I don't want to buy this thing. I'm interested in the games, not a plastic bracelet ( ironically writting this while I wear a black plastic bracelet in my right arm). Reverse NFC. Over WiFi. I can imagine this being huge in Japan, but it strikes me as odd. At least the $25 starter is cheaper than the $35 Pokemon Go Plus. Maybe somebody can make a good Land of the Lost game making use of this? As long as it's an optional gimmick, like with Yo-kai watch, I am fine with it. If it becomes a "forced" accessory, my Pokemon days are over and stick to Yo-kai watch (which game I am currently enjoying a lot more than Pokemon anyway). @aroneous87 Because kids have parents, and the kids will be wanting this. Some parents will buy it for the simile it will put on their child's face, others to get their child to stop asking them for it every day. Not interested. I just hope it's a gimmicky toy, not something crutial for the game. They couldn't have added these features to plus and made one device that could handle both? Or are they worried that would make them slightly less money? Am I glad I don't care for Z-moves. This looks like such a dumb idea too, to be honest. ..probably just me. I find the idea of z moves intestine but not the toy. I'm sure my brothers will be all over this. They really loved the Yo-kai watch toys! Lol is that this generation's version of the power glove? Ah well, even if it doesn't work very well, that doesn't mean kids won't have fun with it. Yeah this is for kids, it's nice and so but I really don't care much. But my god I'm so excited for this game after the last video!!!!! I might consider purchasing this item. I happen to have two of the Pokémon Go Plus on pre-order due to the pure rarity of it. @aroneous87 If you don't like it, don't buy it. Its not like Pokémon Co. are actually hurting themselves by releasing these as people will buy them. @Lunarsickness They've been selling mega rings and bracelets for a while now. I wouldn't mind so much if it were smaller are more subtle like the Pokéwalker for HeartGold/SoulSilver. I just can't see my adult self using one of the these. Still, if it makes others happy I won't knock it. @Frank90 Amen to that. I certainly hope they at the very least Nintendo steps away from the "usual excuse plot". Wonder how Zygarde will fit into this, connection to Solgaleo and Lunaala perhaps? @SpykeKat Ah the pokewalker, that takes me back. Maybe the second gen will get some alola forms. What do you think? @Knuckles Kids these days and similes on their faces. I like the Z-Move attacks but couldnt care less about some plastic watch. I get it from a young demographic point-of-view, just not for me. @Marakuto really?! Mega evolution bracelets that are actually compatible with X/Y/OR/AS?!? I always thought the 3DS could be even greater if it had rumble built in, but after the design was finalized, the only thought I had was that maybe something that the 3DS could sit in similar to a circle pad pro by utilizing the infrared blaster could be built for such a thing, but that also seemed pretty impractical, no one wants to carry around something with that extra bulk. This however, is a great idea that could do just that and more. 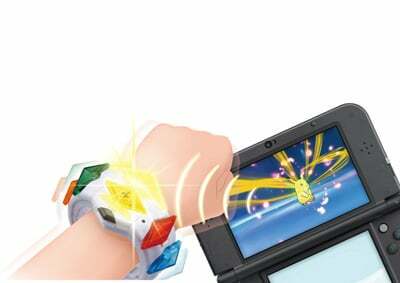 I know it won't get used beyond Sun and Moon, but the idea of a bracelet or braclets (one for each wrist) that syncs up with your 3DS to then give you force feedback would actually be really cool, and I'd totally pay for that extra feature. As it is, I probably will be getting one of these, even if I am a bit old for such a thing. @SpykeKat Aye, though I've always been a Gen V man meself. Zoroark had always been my fave, though I do have a soft spot for Flygon and Lucario as well. Not interested. Just want the game. @-Red- "I've always had a strange fascination with collecting strange and pretty gems/crystals." You must be a pretty big fan of Crash Bandicoot, then. No, they're not required. They react by lighting up when you use Z-moves in the game. @Lunarsickness Their size isn't the biggest for a wrist but it lights up with a working mega stone. There was newer ones that came when ORAS released with the ORAS stones and coloured variation rings iirc. Meh. As if the game wasn't enough for kids to kick, scream, and beg their parents to buy, now this ugly bracelet, as well as the separate jewel kits. Edit: Though, to be fair, I was totally into dorky crap like this when I was a kid, so I guess I don't have a problem with it. @Marakuto So it isn't compatible with Pokémon X/Y on 3ds or is it? @Lunarsickness No, its just an accessory to play with. I won't lie, I'd get this if I was still a kid where I'd buy a bunch of toys. So each Pokemon Typing has an official symbol as well now? More stuff to occupy kids' wrist real estate. Yokai watch, Go Plus, Eleven Band and this Pokemon bracelet. Better get breeding kids with longer arms. @Ed_Fairway Reshiram is one of my favourite legendaries ever! Everybody keep praying for Pokemon Sun and Moon. Anyone know if this will work with both the original and new 3ds? My grandson will want one. I am scared guys....I just preordered a Z ring set. I pray to Zapdos that this will fit my 25 yr old CIS white male wrist. Can't wait! My kids and I are truly excited for the games and toys. If I was a kid, I'd probably buy this in a heartbeat. As a kid-at-heart, not for me. It does look cool with all the crystals in the slots. I wonder what suckers are gonna fall for this. Probably every little kid'll be hassling their parents for this nonsense. Ninty are really cashing in on this plastic trash - shame on them. Lol, they make it more and more complex with stuff like Mega-evolutions and Z-moves (first a bracelet, now a ring? How many accesories has a Pokemon-trainer in a game have to wear), yet they can't ad some proper puzzles to make it all more interesting. And they can't bring it to consoles and doing it 100% 3D! @Kit you didn't have toys growing up? I still have my pokedex somewhere in a box. Toys allow you to let your imagination have a part of playtime. Let the kids and kids at heart have their fun. @Ryu_Niiyama Isn't it enough that they get a new game to play? Sorry but I'm very sceptical about such marketing ploys targeting children (and the gullible), it just feeds into an 'I want, I want' attitude in life. That and it being cheap plastic tat that'll probably break, run out of batteries and never be used. Sure I had toys, I also had an imagination and made do with whatever I had without constantly wanting/demanding more expensive things.